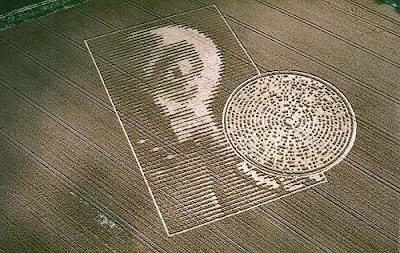 The Crabwood Alien face of August 15 was one of the most famous crop pictures in modern history, but no one could really understand its message. As shown in two pictures below, the schematic face of a "grey alien" was drawn within a large "rectangular box" that contained 60 horizontal lines, just as for an early "mechanical" TV image, chosen in the 1930's because we use 60 Hz AC power. The variable width of each line then creates different "grey scales" (modern TV screens use far more lines to give better pictures). 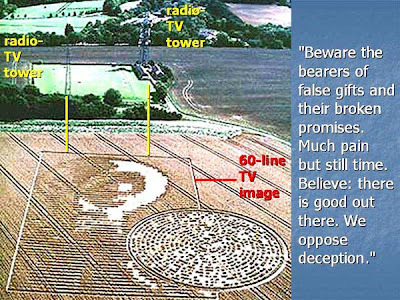 Next, that rectangular box with an alien face was carefully aligned so that it would point at two, nearby TV-radio towers. This was as if to say: "Yes, our new crop picture is really meant to represent the TV image of a grey alien." The general notion is that the Greys have made a secret pact with the US government where they are allowed to conduct experiments on humans in exchange of advanced technology. This is a part of the grand deception confusing the masses and dividing the fastly growing UFO community. There are no evil greys abducting innocent people for their own ulterior motives to populate their dying race in Zeta Reticuli, know this ! Who is making these Crop Circles ?! Freddy Silva's "Stairways To Heaven : The Practical Magic Of Sacred Spaces"